I’m always looking for an excuse to make Nazook. My grandmother Nina used to ask me to help bake and now I relish making it whenever I can with Mom and Daisy. It’s one of the few recipes that is truly Armenian in origin and, for me, a gift from Home. May 28th marks the day that Armenia broke free from the Ottoman Empire and Russia to establish the first republic. Naturally, this is cause for celebration. There will be dancing, toasting, singing, sharing of stories, a happy gathering around a table bursting with homemade goodies. Born in Iran, raised in the States, I have never set foot on Armenian soil. Yet, when asked to identify my nationality, the answer is always Hye, which is derived from our legendary bow-and-arrow-wielding tribal patriarch Hayk Nahapet. Persecuted and scattered all over the world, Armenians have historically struggled to retain their identity as a nation in what is known as a diaspora. Generation after generation, parents have insisted that the mother tongue be spoken at home. It is this determination that has instilled a sense of national pride into the hearts of Armenian children and helped our culture thrive peacefully among various other customs, religions, lifestyles. We inherit much from the foreign countries where we make our homes. Our cuisine is made up of many dishes shared with those of the Greek, Persian, Arabic, Eastern European people. There are very few recipes that are authentically Armenian in origin. Nazook is one of those. 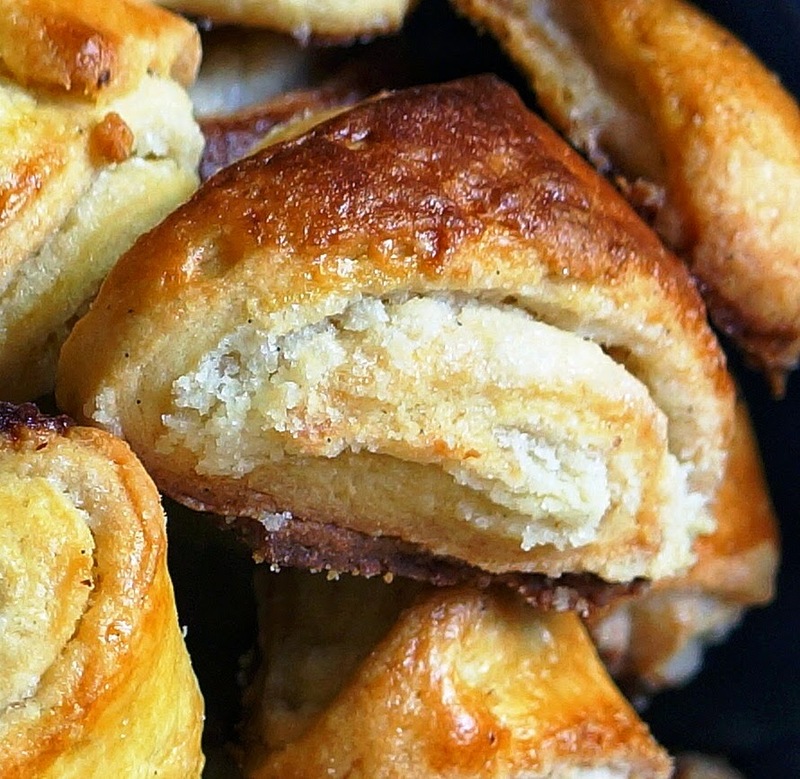 A lightly sweet, crumbly pastry made of streusel layered between delicate buttery dough, Nazook is truly a labor of love, but well worth the effort. It’s a close cousin to Gata which is basically the same thing but in a larger, disc shape. Shortly after the first day of Spring, Armenians make a special form called Mijink. A tradition stemming from our Zoroastrian days, a coin is baked into the Gata. Slices are assigned to every member of a household and whoever gets the coin enjoys a year of good fortune. My grandmother Nina’s recipe for Nazook yields about 4 dozen cookies, which seems like a LOT…until you taste one. Then it does not seem like enough. This is one of those old timey recipes that I imagine the ladies gathering in the kitchen to make together, all the while catching up on the latest news and chit-chat. Maybe that is why my first try was not so good – I worked alone. The next time, Daisy rolled the dough and Mom lent an expert hand. She insisted on including saffron, which gives the pastries a sweet fragrance and bright golden colour. So this second try turned out a batch of even-sized, perfect little beauties. We had so much fun making nazook together and it clearly showed. The aroma of sweet butter took over and the whole house smelled like Christmas. It felt like Nina Mama was right there in the kitchen with us, overseeing our work, enjoying the sweet moment. Yields about 50 2-inch cookies. 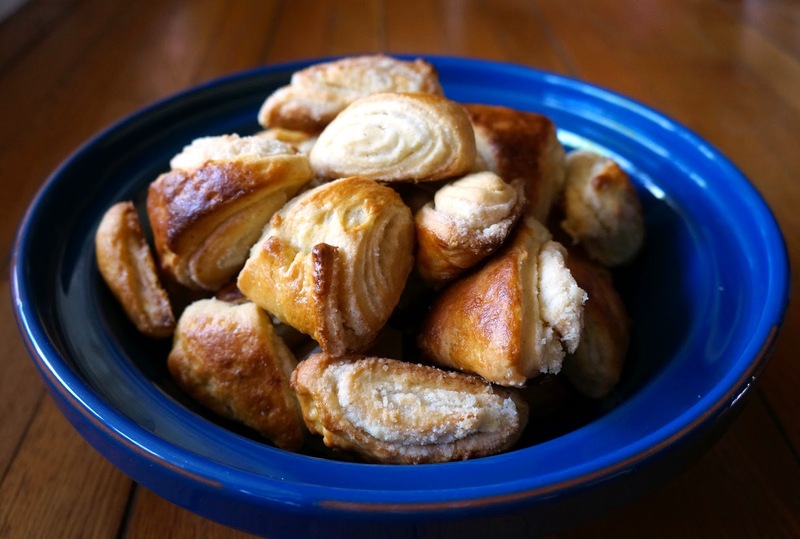 Note: If you have help, cut the dough into 16 parts to make teeny, tiny cute little pastries. Mix sugar and yeast in a small bowl. Add lukewarm water and mix. Set aside until frothy, ~2-3 mins. In a large saucepan over low heat, melt the butter and sugar. Measure the rest of the dough ingredients into a bowl and add the butter mixture. Stir and knead for 5-10 minutes. Divide the dough into 8 equal portions, shape each into a ball, wrap each in plastic. Chill in the fridge for 6 hours. Add a teaspoon of sugar to a small mortar and pestle, add the saffron threads and crush them to a powder. Then steep in hot water, maybe 5 minutes. In a clean bowl, measure the dry ingredients for the filling. Cut butter into the dry ingredients using a fork or your clean hands to a sandy consistency. Add the vanilla, then steeped saffron. Remove dough from fridge and set aside to warm to room temp, 15-20 minutes. Preheat oven to 325 F, then immediately reduce temperature to 300 F.
Make the glaze by beating together one egg and a splash milk in a small bowl. Lightly dust a rolling pin and clean surface with flour. Unwrap one of the dough balls and roll it out to about 1/8th inch thickness. Sprinkle a couple tablespoons of the filling over the dough and gently press filling into the dough with the rolling pin. Roll the dough over from one end to the other end, carefully tucking it the filling in to form a log. Transfer the stuffed dough log to the baking sheet. Using a sharp knife, cut log into about 6 pieces. Repeat the process with another dough ball, leaving about 1/2-inch of space between the cookies as they will plump up in the oven. About 3 dough balls/logs will fit onto a standard cookie sheet. Brush the tops of the nazook with egg + milk glaze and bake for roughly 20 minutes, until golden brown. 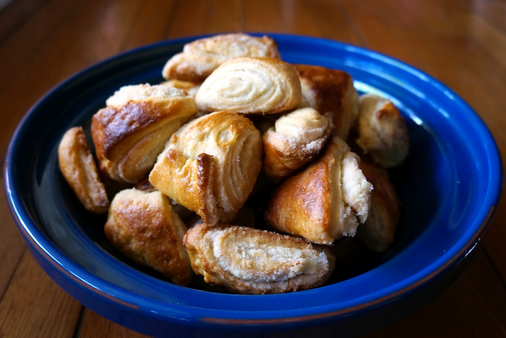 These pastries are best when eaten fresh from the oven. Store them in a metal cookie tin for a couple of weeks. Nazook also freezes well. Anoush! Once upon a time, if you wanted nazook, you had to make it yourself. Nowadays, it is everywhere you look, at least here where there are a lot of Armenians. Most small groceries carry it, baked freshly in town. So you may want to consider moving to Watertown, Fresno or Glendale. But, if you do not live near an Armenian community, you now know how to make it yourself, which is an advantage because nazook is best eaten fresh from the oven while it’s still warm. So, come and celebrate with us! Oh Coco! these look amazing – I can almost smell them cooking!! I love your little sous chef! Collette, I saw these on Instagram and they looked so good! Wish I could have one, they look just like my kind of food! Btw, what does nazook mean in Armenian? Because it means delicate/fragile in Urdu. I love your little helper 🙂 So cute. Hi Coco, I'am Chantal from Travelling Papilles, I just discover your blog full of nice recipes and stories. 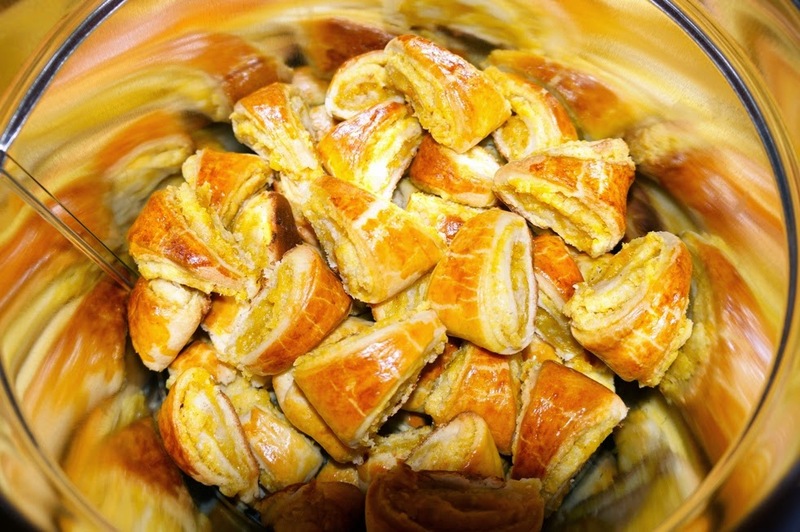 Nazook pastries look a bit like our French croissant. They sound so yummy. I'll give it a try. And your daughter is so cute! Hi, Chantal! Nazook's appeal is in the layers, but it's not as soft as a croissant. It's most crisp and crumbly. I do hope you give my grandmother's recipe a try. Thanks for stopping by. Cheers!